A super healthy and delicious creamy and smooth vegan red lentil curry recipe with a hint of Thai spices and flavors. Gluten-Free too. Perfect fora meatless meal. With all the traditional Thanksgiving cooking going on this week, I thought it was time to share a completely different type of recipe, in case you’re completely over the turkey, stuffing and everything that goes along with it. It’s time for a drastically different recipe. 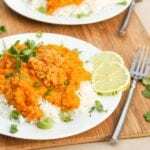 Both vegan, gluten-free and incredibly healthy this vegan red lentil curry dish is a great way to get your eating back on track after all the holiday indulgence. I never used to cook with lentils before. Didn’t know much about them, and always felt like they took forever to cook. That all changed once D and I spent one and a half months renting an apartment in Malaysia this past spring. At the local grocery store there were dozens of different kinds of lentils, so I thought, why not finally delve into the world of lentil cooking? After lots of experimenting I can proudly announce red lentils as my absolute favorites. They’re tiny little redish orangish lentils that cook up in 20 minutes or less. So fast. Now that is what I love and am looking for in lentils. And then they are nice and soft and break down into even smaller little pieces. The reason I do not like standard green lentils as much is I feel like they take forever to cook and are much harder in texture. The little red lentils can literally turn into lentil puree if you cook them long enough (or accidentally overcook them). These are simply perfect with a medley of Thai ingredients and a creamy dreamy sauce. So meet my new favorite vegan red lentil curry. For added substance instead of just a coconut milk based sauce, I’ve thrown in a bit of pumpkin to the mix. By the way in case you weren’t aware cooked pumpkin pureed with coconut milk making an incredibly creamy and rich healthy sauce, either for curries or pasta, or chili, you name it. Pureed pumpkin for the wine. More hidden veggies and a creamier dreamier sauce = win win in my book. Then everything gets mixed together and sprinkled with a squeeze of lime juice and some fresh herbs. Serve over steamed white rice sprinkled with freshly chopped cilantro. Ta-da a meatless plant based weeknight meal is ready to be eaten. This recipe is ready in just under 40 minutes and makes for excellent leftovers to take to work the next day too! For a bit more variety in this dish you could add in some veggies like spinach or arugula as well as some chickpeas or cubed pumpkin or squash. 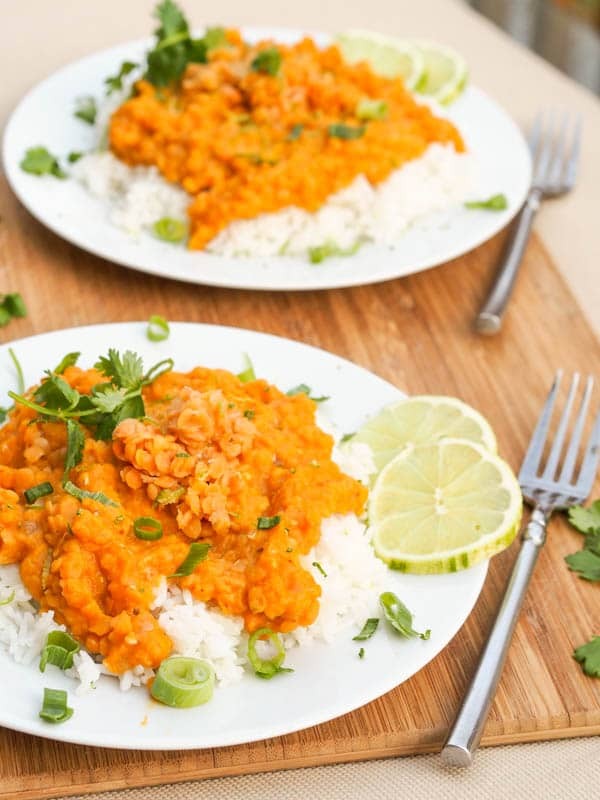 Let me know what you think of my vegan red lentil curry recipe in the comments below! Boil cubed pumpkin in water in a pot for 15-20 minutes until pumpkin is soft when pierced with a fork. Add salt to taste. Drain. Puree pumpkin with coconut milk in a blender of food processor until smooth. In a separate pot combine lentils and vegetable broth. Bring to a boil, reduce heat and simmer for 20 minutes, or until lentils are soft and cooked through. In a separate pan heat 1 tablespoon olive oil and cook diced onion until translucent. Add ginger, garlic and red curry paste. Continue to cook for 1-2 more minutes or until fragrant. Add pumpkin puree to the pan and mix. Add fish sauce, mix and continue to cook for 1-2 more minutes (adding more coconut milk if needed to thin out the sauce). Add lentils and mix. Serve garnished with fresh cilantro and a squeeze of lime juice. 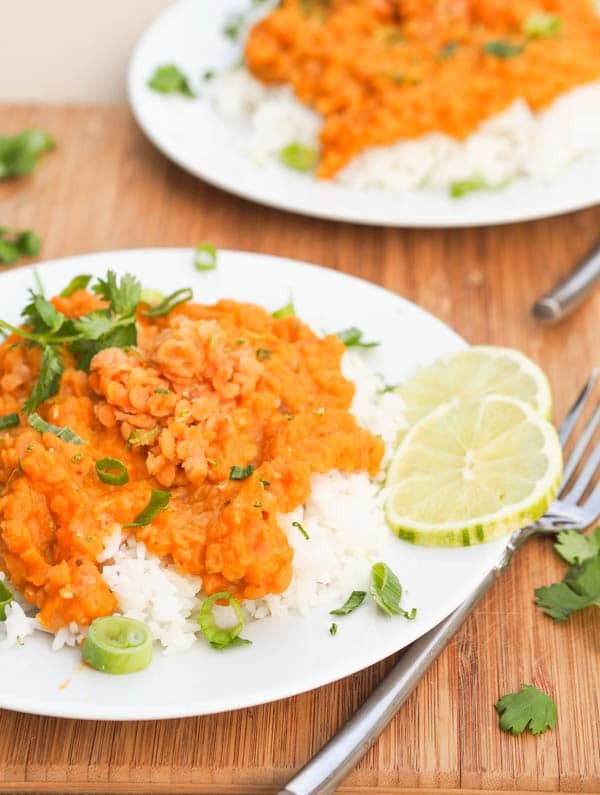 Love pumpkin, love lentils, love curry, love coconut…I love love love this dish! Yummo Vicky! The color of this curry is just beautiful and I am sure would be very flavorful! Thank you so much for sharing with Full Plate Thursday and have a great day.